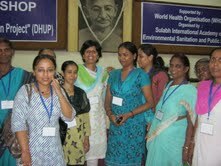 On 17 September2011 Orientation Workshop held on Delhi Healthy Urban Project (DHUP). Workshop was organized by WHO & Sulabh International Academy of Environmental Sanitation & Public in collaboration with Health. Health Fitness Trust. Guests of Honor & Dignitaries Mr. Rakesh Issar, Councilor Govindpuri Kalkaji, Mr. Dhir Singh Kasana, Councilor DDA Flats Kalkaji, Mr. Bhram Prakash Popal, President, Chirag Delhi Block Congress Committee, Dr. Raj Aggarwal, Vice President, Chirag Delhi Block Congress Committee came & shared their views regarding this project covering topics Food habits, Sanitation, Waste Management & Waste Water management. Sudhar Camp Resource Persons from Health Fitness Trust and UMANG Play Center Mrs Sazia, Mrs Rita and Mrs Kumud Shama 'Kuluvi' ,Mr.Smrit Mishra attended the workshop.